Well it’s almost live. 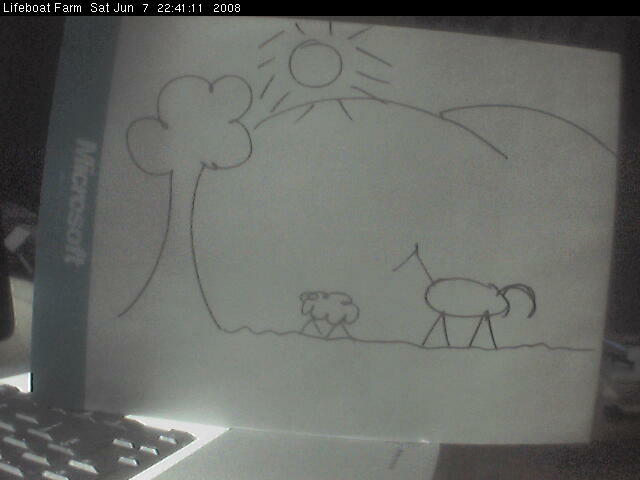 Every 30 seconds or so our wee web cam takes a pic of the farm. Normally it will be facing outside during daylight hours, but as it’s dark outside right now, Karen whipped up a pretty good impression of what’s out there for your viewing pleasure. The camera is a nifty little Axis 2100 we got from a friend of Karen’s. It has it’s own built-in linux based web server and after a bit of fiddling about I got it to auto-upload pics to lifeboat. It has a whole lot of security and motion detection features but I haven’t played with them yet (perhaps another rainy day). Hi guys, just came across your website today ( 14/4/2010) my wife is going back to NZ in a few weeks to scout around for a acreage lot for us, I have read your profile and stuff on your site here, I can find little to disagree on, although I agree with peak oil ( I have been researching for 2 years on the subject ) I frankly think , we are headed for a collapse of the US currency and of course the Australian and NZ system with it. I think that there is a lag time of about 5 years, maybe less if Obama does nothing about the debt, there has to be a massive de leveraging of the US dollor. I keep daily reading survival Blogg and Matt Savinars peak oil page….